Finally made it up to the local branch of Micheal’s craft store after work Wednesday to hunt down material for the two domes of the Russian church. I had planned on using 1″ wooden spheres, but the shelves of random wooden shapes were fairly well picked over and they had no wooden spheres of that size at all. They did have 1″ wide turned wooden shapes advertised as “decorative rod ends”, though, and I realized they’d make much more interesting onion domes than the simple spheres I’d been planning on. When I got them home I drilled holes in the top and inserted lengths of wire. One useful thing about turned wood shapes, it’s usually fairly easy to find the centre point, as the lathe tools always leave small ring impressions on the wood. The wire got superglued in, then I used a twist of tinfoil to form the core of the uppermost section of the onion shape. Terracotta Milliput is cheap, sure, but tinfoil is even cheaper! After that I mixed a small batch of terracotta Milliput and worked it around the wire and foil. I used a 1″ circle I’d cut out of styrene as a rough guide to keep the upward concave curve consistent, and smoothed things down with a wet fingertip. I didn’t fuss with the surface finishing much, a bit of wet sanding after the milliput is dry and another thin layer of putty will finish everything off nicely in due course. So, behold the domes of the Church of St. Boris the Intoxicated, with the putty still setting on them! The onion domes take shape. Click for slightly larger, see text for details! Aside from the domes, the roofs are finished structurally, all shingles and trim in place. I still have to finish the trim around the door and windows, then it’s off to painting. 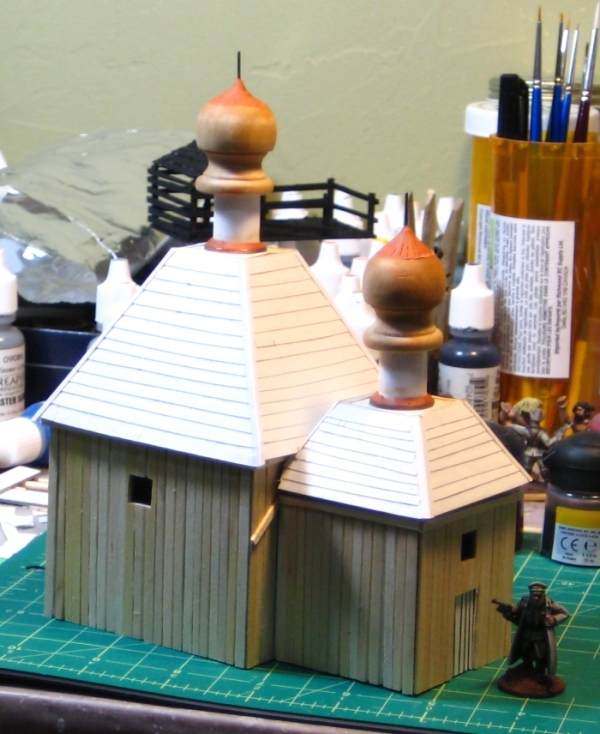 A quick pair of photos of the small Russian church I’m building for Russian Civil War gaming in 28mm. 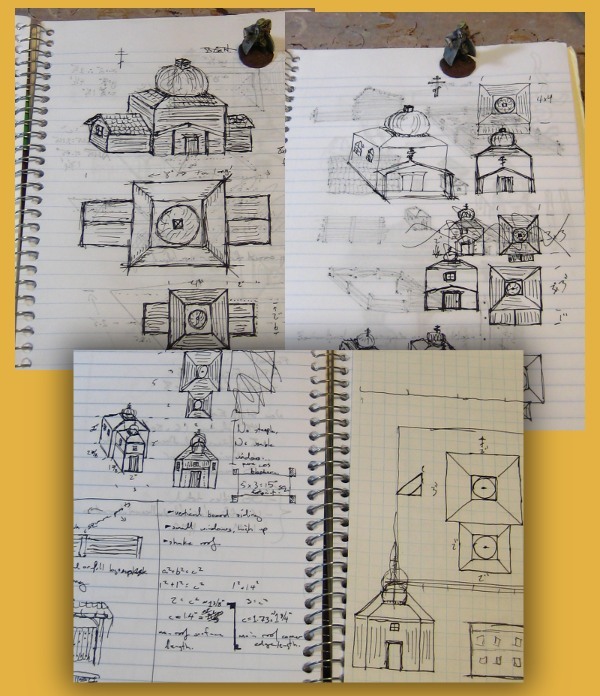 Earlier in January I discussed some planning and thoughts I had for a wargame-scale small church, and while it isn’t going as fast as I had hoped progress is being made! My work-in-progress Russian church, alongside the two earlier Russian huts. As with the huts, the basic structure is mattboard with coffee stirsticks providing the woodwork. 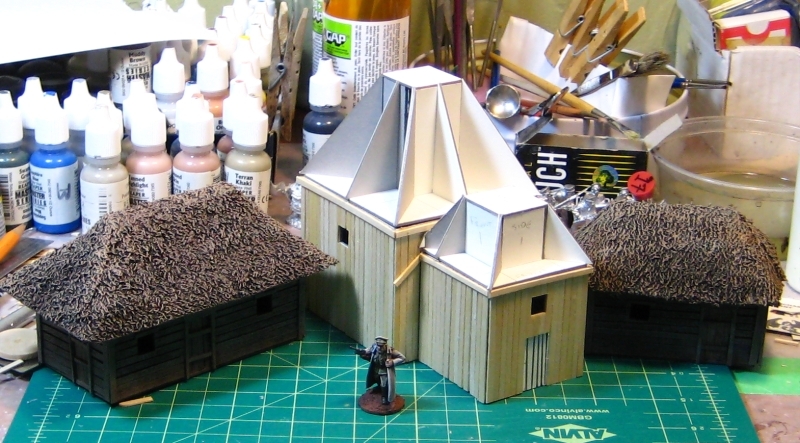 The roofs of the church are going to be shingled rather than thatched, and while doing shingles with built-up strips looks good, it is frankly tedious… The smaller roof is done except for trim, though, and the main roof is about half done, then it’s on to the domes to provide that very Russian look that’s so distinctive. 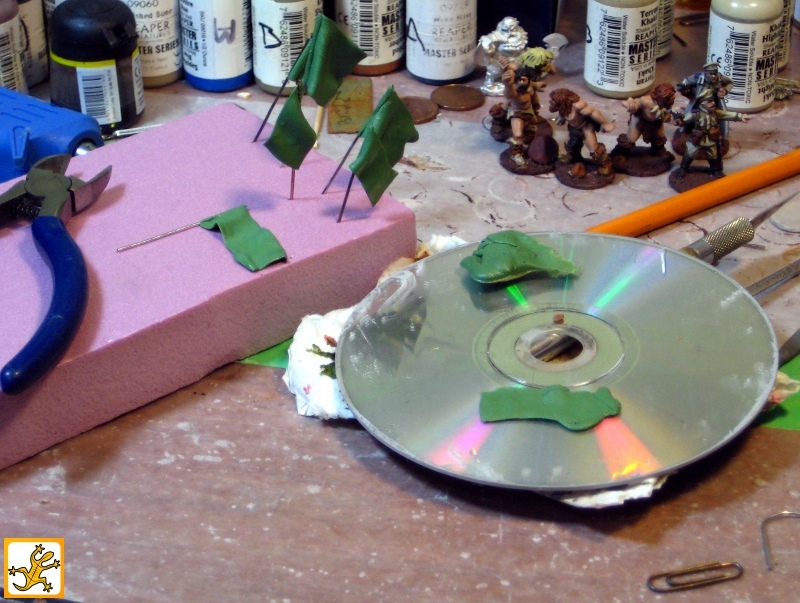 It’s been a bit of a slow ten days or so on the wargaming front around here; I wish I could say there was a proper reason, but I just haven’t spent much time at the workbench. One of those weeks. 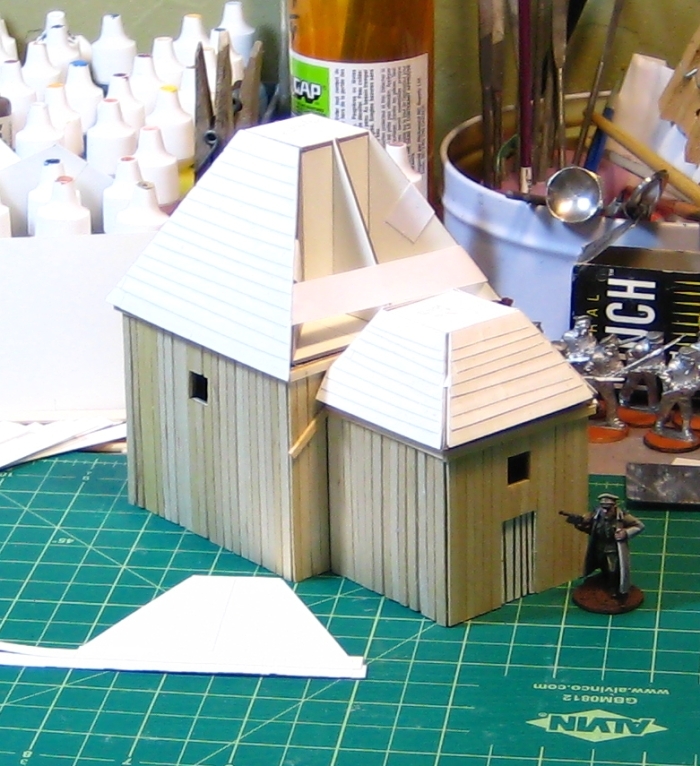 Regardless, earlier this month I did finish both small Russian huts/farmhouses that I started over Christmas, and the Russian church is coming along nicely. Here they are together, with a pair of Brigade Games’ 28mm White Russian officers for scale. The walls are mattboard and wood from coffee stirsticks, the roofs are towel with cardboard structure underneath. The fronts of a pair of Russian rural buildings - huts, small barns, possibly small farmhouses. The smaller one on the left is 3″x2″ and roughly 2″tall, the slightly larger one on the right is 4″x2″and about 3″ tall. Removable thatch roofs from towel. The hipped roofs are mattboard and light card underneath with towel soaked in diluted white glue as the thatch. The roofs removed, showing their structure slightly. Here you can see the roofs removed and flipped over. The structure of the roofs is all just cardboard and I’ve had no warping at all despite the towel for thatch being fairly liberally soaked in diluted white glue after it’s glued down. 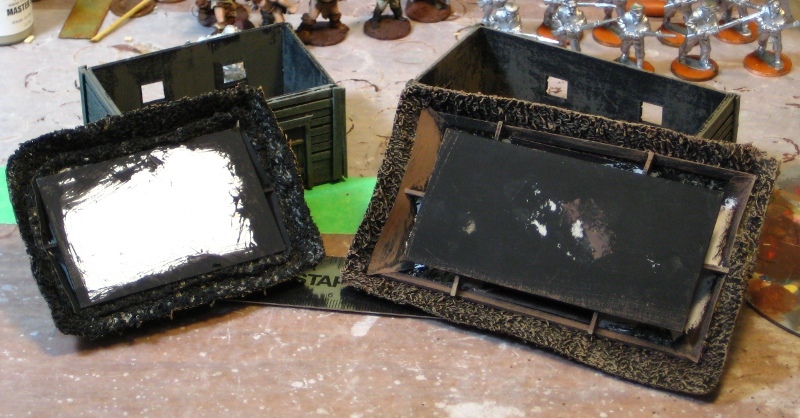 Both buildings got a basecoat of black paint mixed with white glue (my standard scenery basecoat), the woodwork was drybrushed with a grey mixed with some tan followed by a second drybrush of paler grey. The thatch got the same black/white glue base then a couple of drybrushings with various brown/tan/grey mixes. The towel soaks up paint and glue as well as you expect towel to, even during drybrushing — expect to go through paint like crazy. 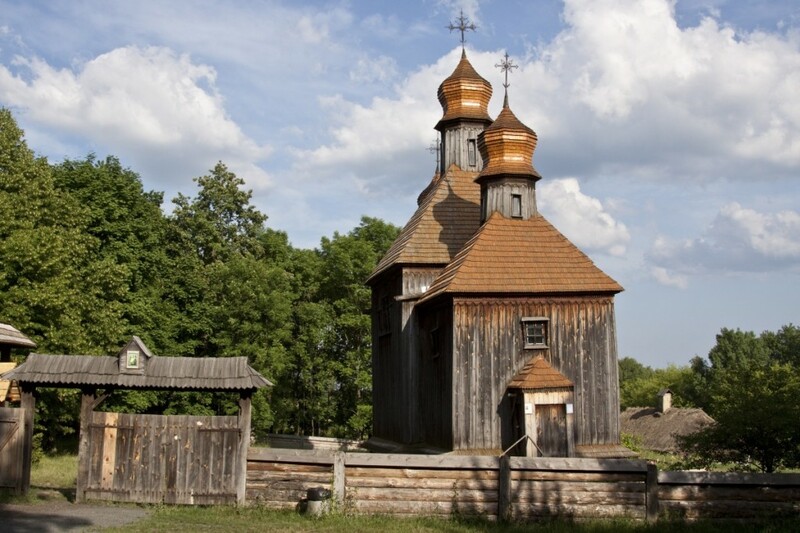 I have vague plans for a couple more buildings for a Russian hamlet, maybe something in whitewashed plaster more suited to the southern portions of the country, and of course the Russian church is nicely underway. More about that tomorrow! Happy New Year! Just back from a week away from my computer and my workbench, spent visiting the folks inland, and counting down the hours until it’s back to work and such. Although this website has been around on various hosts and under other names since 1998, 2011 was our first full year in this relaunched blog format, powered by the awesome WordPress and a renewed and expanding interest in wargaming! So how did that first year go, anyway? We started rebuilding the site back in September 2010, officially relaunched in January 2011, and we’ve been going steadily since then! According to the web statistics package we run, there were just under 17,000 visits to the site, with just over 20,000 pageviews (just over 1 page per visit, in other words). Most of our visitors are from (top 5, in order) the US, UK, Canada, Australia, and Germany. April 2011 was the busiest month we’ve had so far, with just under 2,000 visits. In terms of posting, this post is the 149th posted to Warbard, with the vast majority — roughly 130 — being from 2011, giving us a rough average time between posts of under 3 days. Not bad! The most popular single article was the review of .45 Adventure 2nd Edition, with various terrain articles and gallery posts filling most of the rest of the top ten. We talked about Inkscape quite a bit, lots of pulp adventure, and more recently the Russian Civil War. Going into 2012, expect more RCW, more pulp, more terrain & buildings, and of course the two main gaming conventions locally are rapidly approaching in February and March/April 2012! 2011 was a great year, and I expect 2012 to be even better!